Following Microsoft’s recent announcement that it would be bringing Halo: The Master Chief Collection to PC, the computer and gaming company has revealed that PC gamers will be able to test the title ahead of its release. 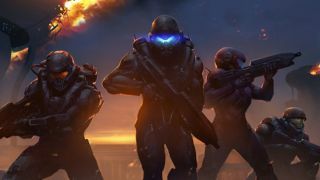 The early testing is part of the Halo Insider Program, which fans of the franchise can sign up to in order to “provide feedback and insights” on in-progress game releases and other “franchise initiatives”. It’s worth noting that not every member of the Insiders Program will be selected for testing, and although we have a vague release date of ‘later in 2019’, the opening for early testing is even less concrete. The Halo: Master Chief Collection was first released for Xbox One in 2014, but the package will be available on PC for the first time at some stage in 2019, and it'll be sold on both the Steam marketplace and Microsoft’s own storefront. Included in the package is Halo Reach, Halo: Combat Evolved, Halo 2, Halo 3, Halo 3: ODST, and Halo 4, although they won’t all be made available simultaneously, with Microsoft announcing a sequential release of each title in chronological order (as above). There is a catch, however – as Kotaku reported, the collection won’t be a part of the Xbox Play Anywhere program, which means that if you already own it on Xbox, you’ll still need to buy another copy in order to play it on PC.